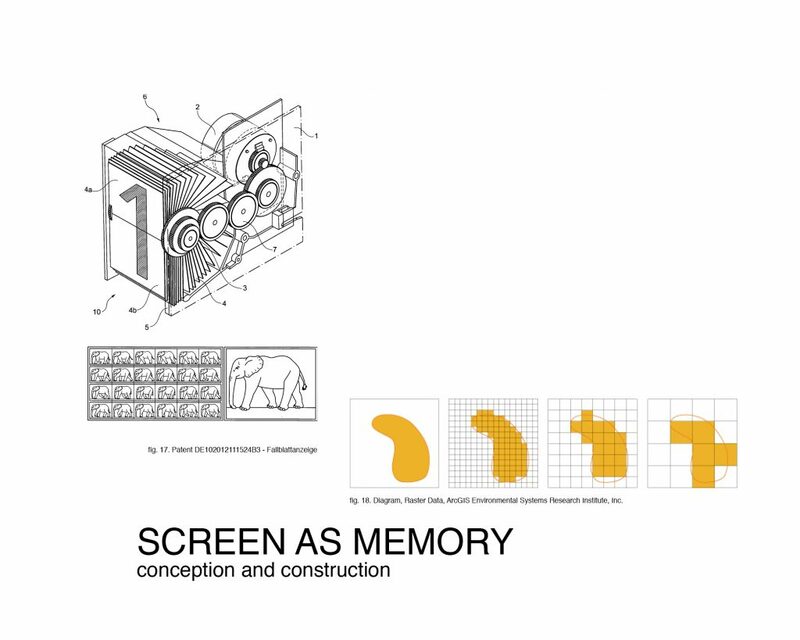 A proposal for an artwork placed as an LCD screen on the front facade of a children‘s hospital. Parallel to the progress of time, the sky image moves and shows 24 hours in advance. The real sky contrasts with the future sky. It is a dialogue between the present and the future. The image is calculated from a range of data collected worldwide. It is intended to captivate with its affinity to the natural model. This simple idea is the distillate of a conceptual analysis of the identity of the hospital. It stems form the desire to redefine the identity of the entire institution by means of a contemporary work of art, a dialogue of technology with poetry and a study of placing anticipated reality within reality. 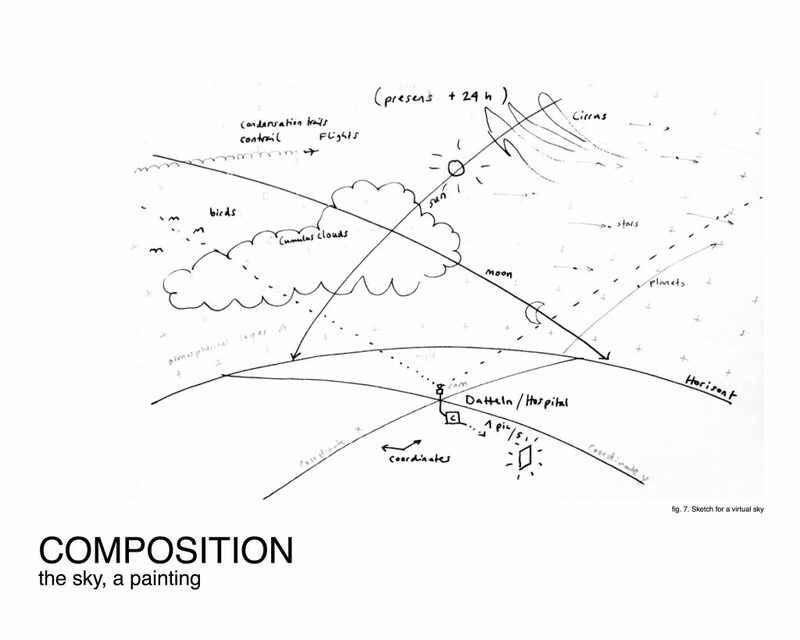 The project Sky Of Tomorrow was a study commissioned by the hospital organization in Datteln, Germany. Our application to projectanywhere.net endeavors to show the project‘s potential for other places and other contexts. 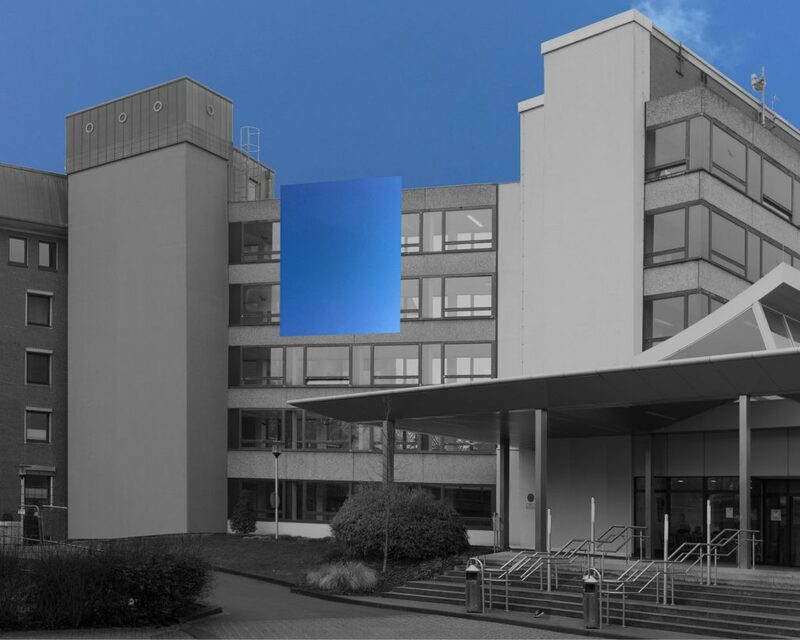 The commission to make a proposal for an art piece for the facade of a children‘s hospital positioned at the main entrance of the building has been the starting point for a research project about how to represent the spirit of the institution on the main facade. A medium for representing identity on a facade is the mosaic. The mosaic stores a static moment in time and material (i.e. glass stones reflecting the color pigments). In contrast, a screen has the ability to be in the moment without storing any data in material form. 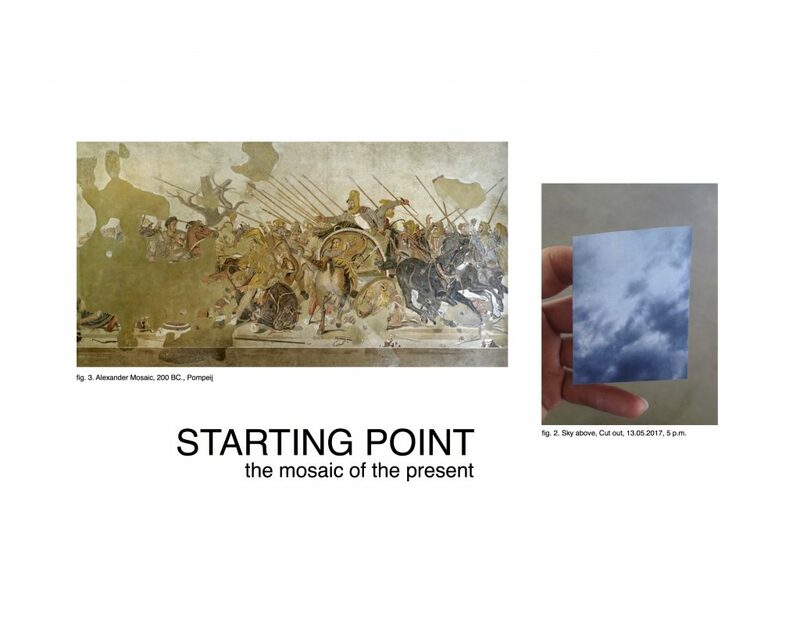 Since identity is something stable, but manifests itself in the present, we want to combine the durability of the mosaic – to store the institutional spirit in time – and the capacity of the screen – to be in the present. We are looking for a mosaic to depict the present. A mosaic stores a picture for eternity. Such an eternal image can depict an ephemeral subject and keep it for the future. 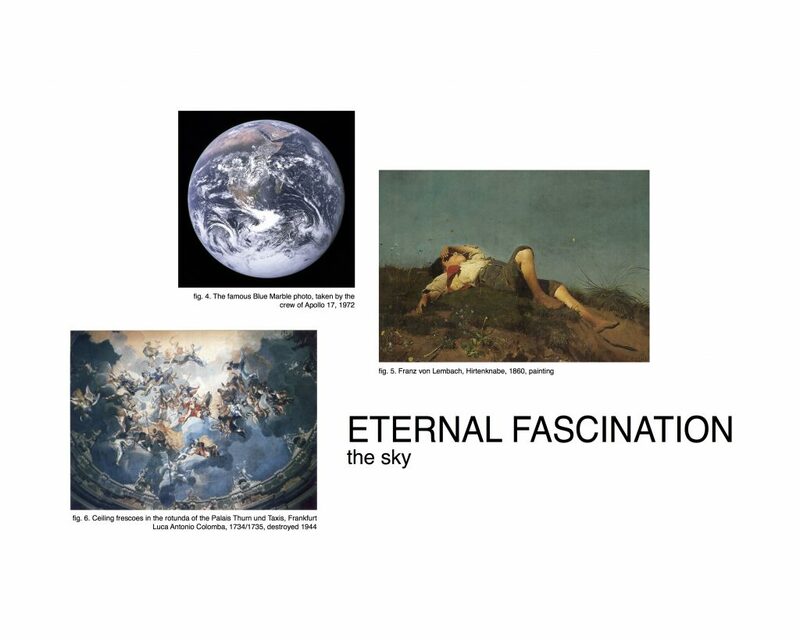 We equally strive to create an image of an ephemeral entity that of the eternally changing sky, as a symbol of a constantly changing world. In a similar sense, the identity of a person adapts continually to the world: new clues are found and old ones are repelled. The identity of a human being is conceived as something ever-nascent and not as something static as Nietzsche pointed out.¹ Thus the Mosaic of the Present also becomes a symbol of the nature of man. What is the weather going to be like tomorrow? This question is asked by everyone, everywhere, all the time. This simple question will be the starting point for long intense discussions of the artists among doctors, patients, engineers, physicists, meteorologists, IT-specialists, interaction and game designers. The oldest mosaic is the sky. It always looks different, but is the same as centuries ago. We want to show the present, by making an image of tomorrow. 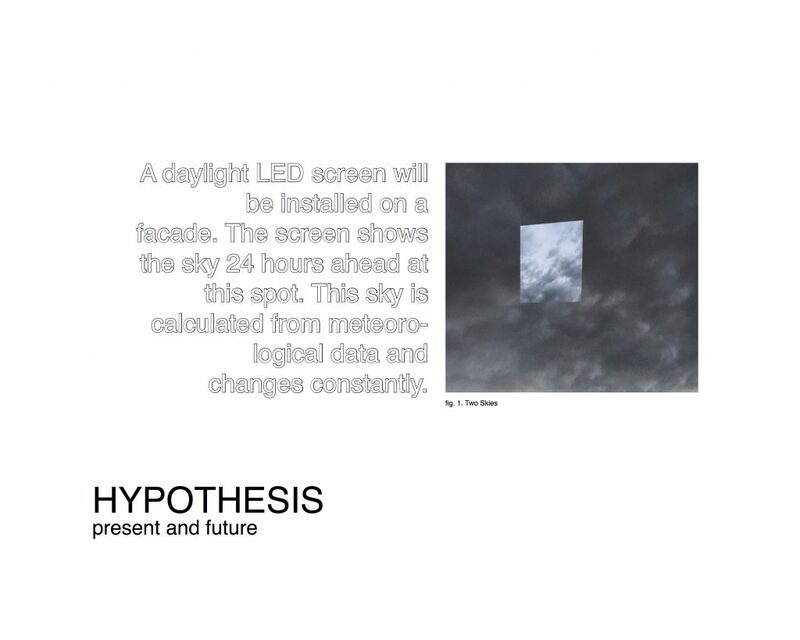 Therefore, we will install a large daylight LED screen which shows calculated predictions of how the sky will look in 24 hours. The image is calculated from various sets of data and changes constantly. The screen shows a picture that is older than any rock on this planet. The sky has existed since the earth has had an atmosphere. And since then, the sun‘s rays have broken into the atmosphere‘s water drops, which have absorbed the blue light. The heat of the sun, beating down on the world‘s oceans and the humid continents, makes the water evaporate, and rise, and turn into clouds. This spectacle has accompanied life on earth since the first hour. 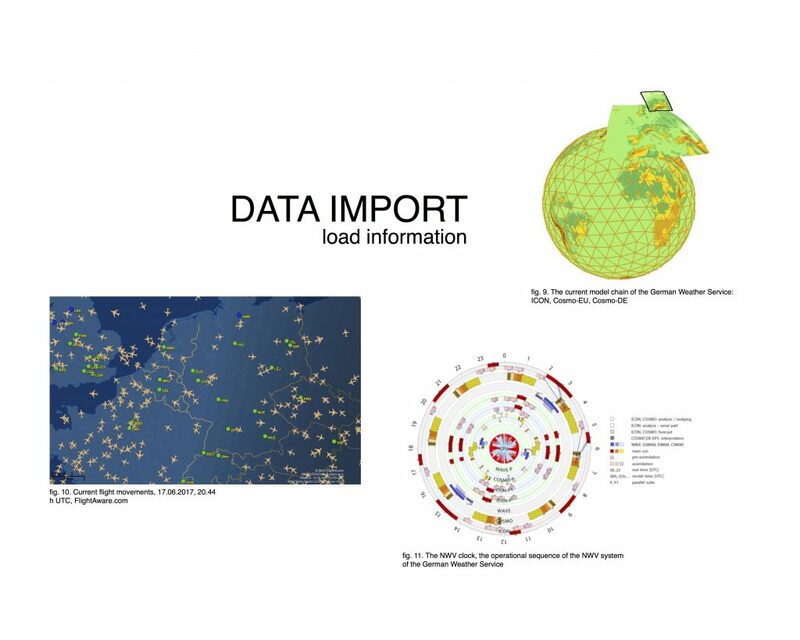 The project is a calculated ‚painting’ from the large source of big data available from the global worldwide network: meteorological data, aircraft movements, mathematical calculations of the movement of the orb, data of migratory birds, which are collected to protect them from flying into wind parks. Everything is joined together to form a digital vision of the future. This simple idea – a humble statement – is an invitation for the observer to raise important questions about today‘s reality. The aspect of the sky is unique at any place at any time. And yet everyone is familiar with it and can see it from every place on earth. The complexity of today‘s global information network, the Internet, is reflected in the complex genesis of this celestial image. It is a portrait of our digital era. When asked how to create the digital ‚painting’, people have suggested to simply record the existing weather over a year and replay a recorded segment of it according to the weather forecast of the following day. This technique would show the future with playbacks from the past. But since we want to make a mosaic of the contemporary, we want to stay connected to the present as closely as possible. The past is not acceptable. The sky has always been the canvas for the structure of society, religion and other hierachical structures. In contrast, the shepherd boy painted by Franz von Lembach (fig. 5) is looking up at the sky and loses himself by projecting his own dreams and visions onto that blue canvas. Looking at the sky can liberate a human from his earthly connections and constrictions. The sky over time is not only a representation of social and civic structures but also a mirror of our individual way of life. The first pictures of our planet from space (fig. 4) have changed our perception of Earth completely. From this moment in time, we started looking at the Earth from the outside. Man not only possesses the land but has also conquered space. Every single movement is traceable, all human affairs have become transparent. With the acquired data, we can make innumerable predictions. Our technological age is becoming more and more complex. In this age, we would like to look at the sky like the shepherd boy and linger in a moment of contemplation, to gain a new understanding of our times. Hannah Arendt stated in 1958 after the astronauts had flown out into space, that whatever they explored out there, the most important discovery was the planet earth itself.³ The globe as an object, with a finite expansion (fig. 4). The look up into the sky is a different one than the one down to the earth. This elevation to the sky (this digital painting) has a view to the top. The look up is the perspective of the human. The human condition on earth. This is unlike the perspective of the world maps, the baroque divine perspective, the perspective of the satellites, the perspective of surveillance. With this artwork we require people to think about what our time and our networking is all about. We take the perspective of a child in a meadow, who looks high up into the sky, a child that asks the questions, what do I want to do with my contemporary possibilities? What is my potential and what do I have to heed? Aside from the philosophical aspect of topics such as: power, dreams, order, territory, forecasting, algorithms, ephemeral, Anthropocene, big data, surveillance and spirituality, the sky also has a picturesque side. By looking at the outcome as a painting, the project assumes another layer of meaning. In order to make the image, a camera is positioned vertically, facing the sky. Weather elements, such as clouds, fog, sunrays and rain are only one feature of the sky. It furthermore consists of birds, planes, satellites and planets. Many of the latter features and their positions are known 24 hours in advance and partly even available publicly. On the basis of this data, it is possible to make an prognosis for the following day. The search for the best data-source for weather modeling always led to national institutes which provide the weather forecast. The reason for this is: In order to provide the most precise forecast, one needs a super computer to calculate the forecast from a less precise, world-spanning model into a more precise national model, (ICON (World, grid 13 km) -> COSMO EU (Europe, grid 7 km)-> COSMO DE (Germany, grid 2.7km)). In the end it’s a matter of national wealth if a country is able to run its own institute of meteorology. Unlike a map, the sky can not be divided by borders. The weather map shows the weather within borders. The maps can be divided into very small pieces. And on each of these pieces you will find at least one person, who demands the right of property. Jean Jaques Rousseau stated once that the fruit of the earth belong to all of us, and the earth itself to nobody.⁴ The earth, as we know it, is still a divided place. The sky is unified. We do not want to propose a future identity based upon territorial or national divisions. Free and boundless must be the gaze of a child when it looks into the sky, like the one in the painting of Franz von Lembach, The Shepherd Boy (fig. 5). It represents the wish of liberation in thinking and speech in the time of Biedermeier. Back then, revolutionary people had to flee into privacy to escape the constrictions of the nobility who relaunched the old system in the Age of Restoration after Napoleon’s banishment. This boy, looking up into the sky, sees no divine assembly of angels and popes ruling the world. He can simply follow his dreams and hopes. The image of the sky of tomorrow is created in three steps: In the first step, all data needed are downloaded from various real time sources via Internet. The most important part of this data, the weather parameters, are taken from international weather models. These models are run every three hours and the data is valid for the next 27 hours. Aside from the weather data, the positions of the planets, planes and other flying objects are downloaded from various sources. The second step is the translation of the imported numbers into 3D objects in accordance with time and position. 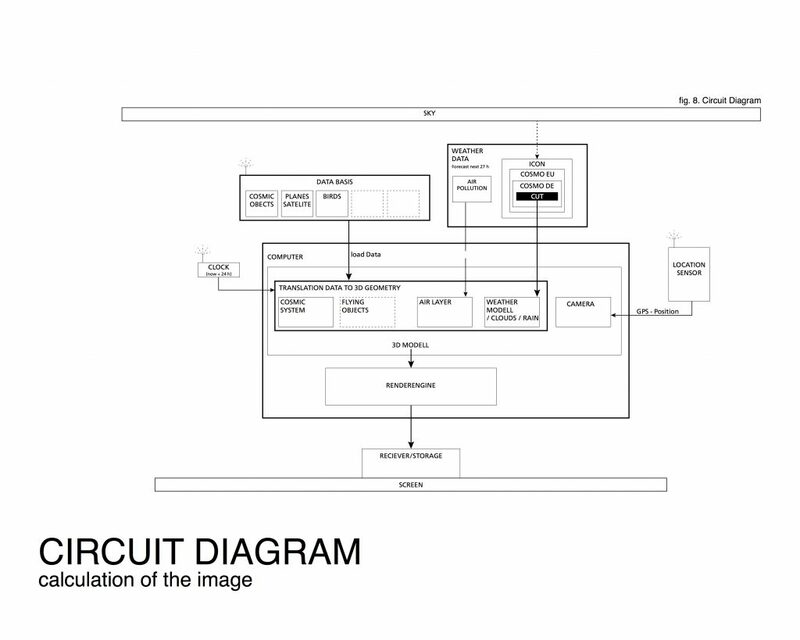 In the third step, the three-dimensional model is run through a rendering engine to create the final image. This image is then sent to the screen. Hans Haacke‘s work of art, DER BEVÖLKERUNG, in a courtyard of the German Reichstag building is an homage to all the people who live in this country⁵, regardless of where they were born or what passport they possess. Today, identity can no longer be understood in the collective, it is neither homogeneous nor national. The children in the hospital near Dortmund, Germany, are both: children of Germany and Europe, but they might also be rooted in Africa, Asia or America. This artwork suggests identity as something boundless and omnipresent. Yves Klein was the artist who sat under the bright blue sky and willfully put his signature on the lower edge.⁶ He did not invent the sky, but he established monochrome blue as art, as his art. In this respect, the void space seems to be a consequence of his thinking. At a later date, he exhibited the empty space of a gallery: ‚Le Vide‘, the void space.⁷ He placed himself in the room and told the people: „First there is nothing, then there is a deep nothing, then a blue depth.“. Here Yves Klein uses the void space – so to say the blank canvas – to evoke his imaginary and immaterial and even invisible blue sky in the visitor‘s head. The sky becomes a deep nothing while it is being contemplated. In fact, it mirrors endless potentiality. The artwork will not produce any deposits in the future. There will be no digital sedimentation of past states. This work of art will not contribute to the collection of big data. We want to prevent a digital Anthropocene. Showing the present without digital storage is a manifesto against the trend of our digital age. To be able to calculate the sky of tomorrow, a large number of different data sets are necessary. These data are downloaded live from the Internet. Since these data will be in different formats, they will have to be translated in order to fit into our system. For the visualization of the planes, we need information about flight level, speed, plane type, and also a 3D model of that specific plane. The weather information is calculated in different models with certain model boundaries and resolutions. Since very high-performance computers are needed to run these weather models, the resolution is dependent on model size. The best resolution in Datteln is provided by the Cosmo-DE model, which is a section of the Cosmo-EU model which is again a section of the ICON global model. The Cosmo-DE model gives information in a grid size of 2,7 km with 50 layers superimposed. The different models are based on each other; the boundary conditions are researched in academic institutions. „Mori‘s original hypothesis states that as the appearance of a robot is made more human, some observers‘ emotional response to the robot become increasingly positive and empathetic, until it reaches a point beyond which the response quickly becomes strong revulsion. However, as the robot‘s appearance continues to become less distinguishable from a human being, the emotional response becomes positive once again and approaches human-to-human empathy levels. Alors que j’étais encore un adolescent, en 1946, j’allais signer mon nom de l’autre côté du ciel durant une fantastique voyage „réalistico-imaginaire“. Ce jour-là, alors que j’étais étendu sur la plage de Nice, je me mis à éprouver de la haine pour les oiseaux qui volaient de-ci de-là dans mon beau ciel bleu sans nuage, parce qu’ils essayaient de faire des trous dans la plus belle et la plus grande de mes œuvres. 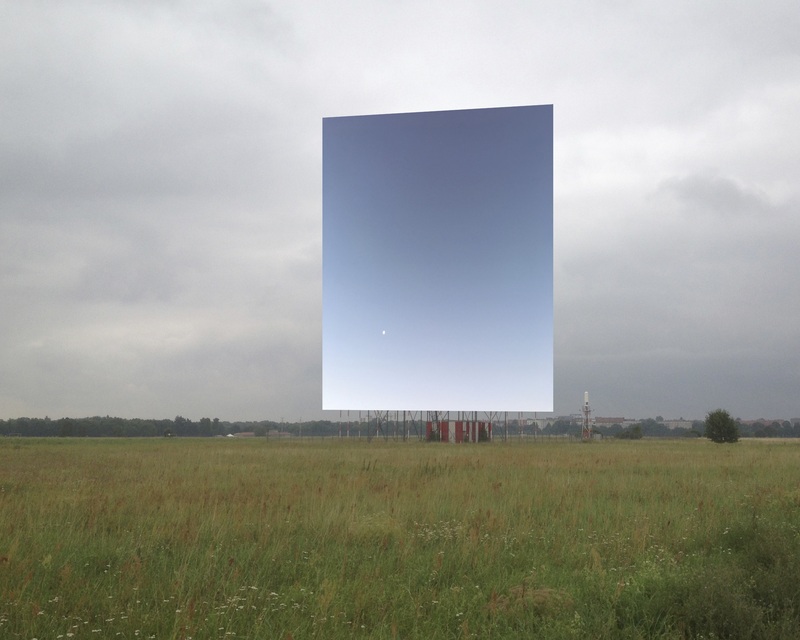 The screen constantly shows the live prefiguration of the sky in 24 hours. The screen is a temporary storage medium of the information. Whenever a pixel changes, the old information is overwritten and lost. The screen thereby turns into a mosaic. The screen consists of small elements (960 mm x 960 mm, 96 x 96 Pixel, 42 kg) and can be any size depending on space and budget. These elements are mounted onto a sub-structure. This sub-structure can be installed onto a facade or driven around on a truck.